Following deployments in Asia and Australia, Singapore-based Techmetics announced this week it would unveil two new exclusive lines, the Techi Butler and Techi Cart series, to U.S. markets. The line of multi-point delivery robots with a multi-level fleet management system are aimed at the hospitality, healthcare, casino, and manufacturing sectors. For the past seven years, Techmetics has been developing its robots and add-on software through its own proprietary technology, the company said. 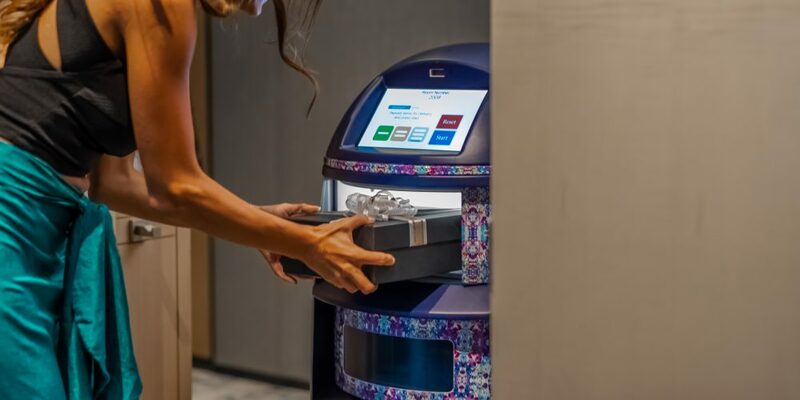 Distribution of its robots includes countries such as Australia, the United Arab Emirates, and Thailand, and the company has worked with international brands such as YOTEL, AccorHotels, and the Las Vegas Sands. The Techi Butler is a service-oriented robot for multi-point delivery, Techmetics said. The product is designed for the hospitality and healthcare industries, disrupting the way hotel guests receive room service and deliveries. Techi Butlers are also serving industries such as office building, and food and beverage companies. The company said the robot can assist staff with tasks such as grabbing documents from the printer room, distributing office mail, and even delivering coffee and lunch orders from a reception area. The Techi Butler includes three types of models, with options of two or three standard compartments, and a payload up to 132 pounds. Features include up to three deliveries in one journey, automatic compartment doors, a 10.1-inch touch screen for user communications, an integrated elevator management system, and private automatic branch exchange (PaBX). Robots can engage with end users through mobile features by calling or sending text messages directly to a user’s phones. Techmetics said the Butler series can be leased or purchased by companies. The Techi Butler is currently being used at the YotelPad Miami, and the company said it plans to expand into other hotels and resorts. The Techi Cart series is designed to assist housekeeping departments, and kitchens in hotels and hospital with bulk delivery needs. The Cart line includes a Techi Linen Cart, Techi Food Cart, and Techi High Payload Cart, the company said. Based on the type of card, payloads range from 220 to 550 pounds, with different configurations based on a user’s operational needs. The robots can autonomously pick up and drop off linens and food carts without assistance, operating on multiple floors and facilitating back-of-house services from areas such as laundry rooms, kitchens, and housekeeping departments, Techmetics said. The company said it also plans to introduce other models, including the Techi Drinks Serve, Techi Concierge and Techi Stack models, to the U.S. later this year. Both series of robots can move at a maximum speed of five feet per second, and have a 13-hour continuous battery life. The company said the robots can be personalized according to a company’s branding or theme through display settings, language choices, and dialogue. News, Retail & Hospitality, Service, Delivery Robots, hospitality, Retail & Hospitality, service robots, Singapore, U.S.